I hope you are doing great. I’ve been busy making some changes here at home and upcycling some furniture which I hope to be able to show you soon. At the same time, we were invited to a birthday party, it was a close friend from Little S so we had to think what to make for him as a gift. 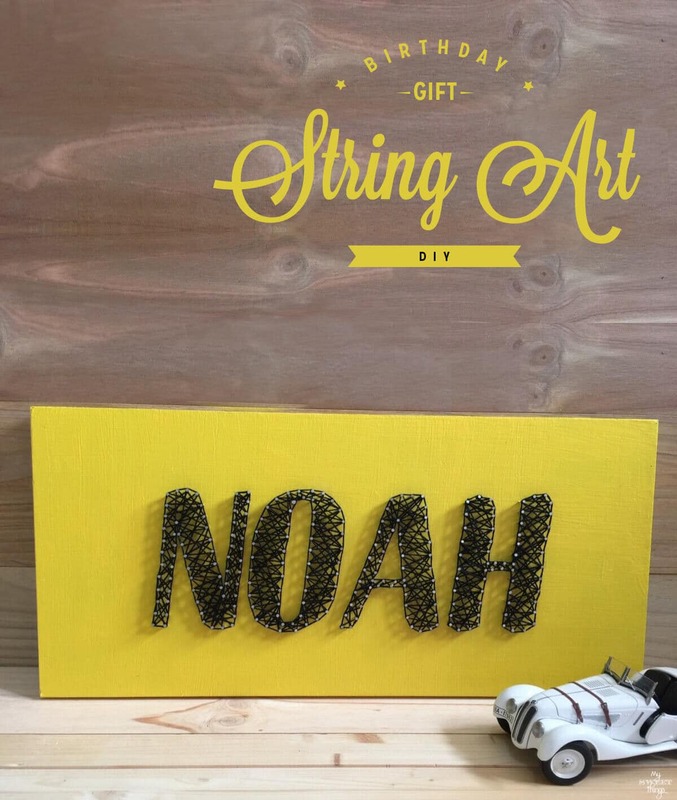 We had several ideas but we all agreed on a string art name because it is cool and quite fast to do it. Do you remember the string art we made for Felix? We wanted to do a twist on this one. I filled the hole with wood filler, and once dry the girls painted it. 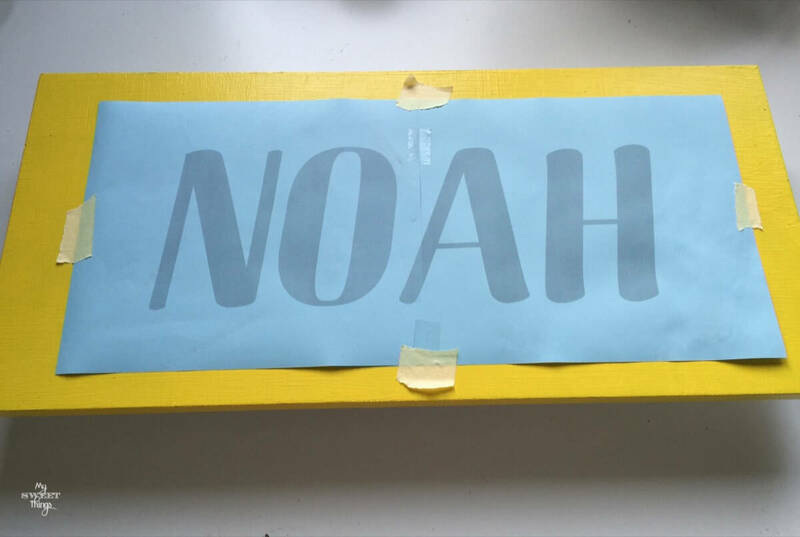 We chose yellow for the base because Noah, the friend, told us he loved yellow and black. 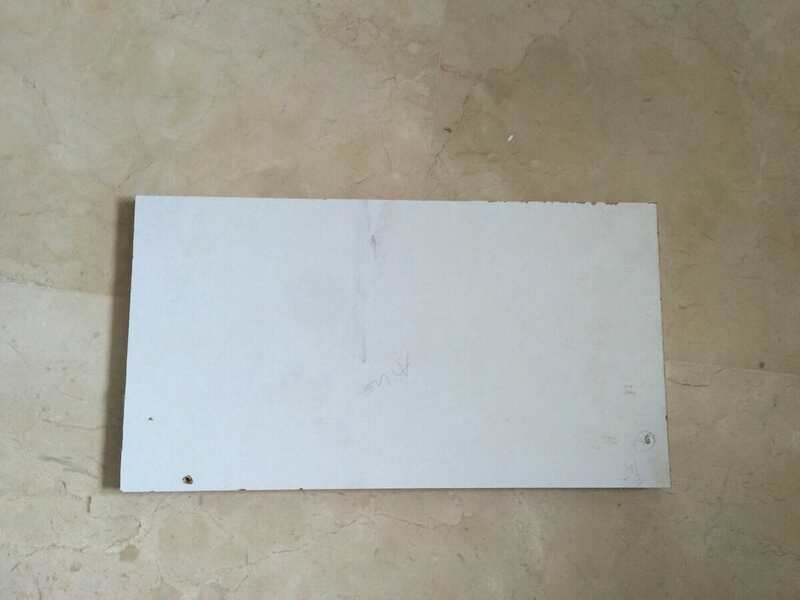 Then I designed the name, printed it and taped the papers on the wood to prevent them from moving. Now the fun began! I started to nail everything in place evenly until I did all the letters. Then I took the papers out and started to wrap the thread around the nails until it was looking good and wasn’t any gap. I love how it looks with capital letters too! Thanks for stopping by and remember if you want to see some other projects you will find them at the Gallery. This entry was posted in DIY and tagged Before & After, Chalk Paint, DIY, Gift, Kids, Scrap wood, String art, wood. This looks great Pili. Another brilliant string art. gift. They look so nice with the bold black string. And the dark string pops out in front of the yellow sign.Another beautiful gift. Pili, that’s pretty amazing!! How long did it take you to wrap the strings? You did a great job! 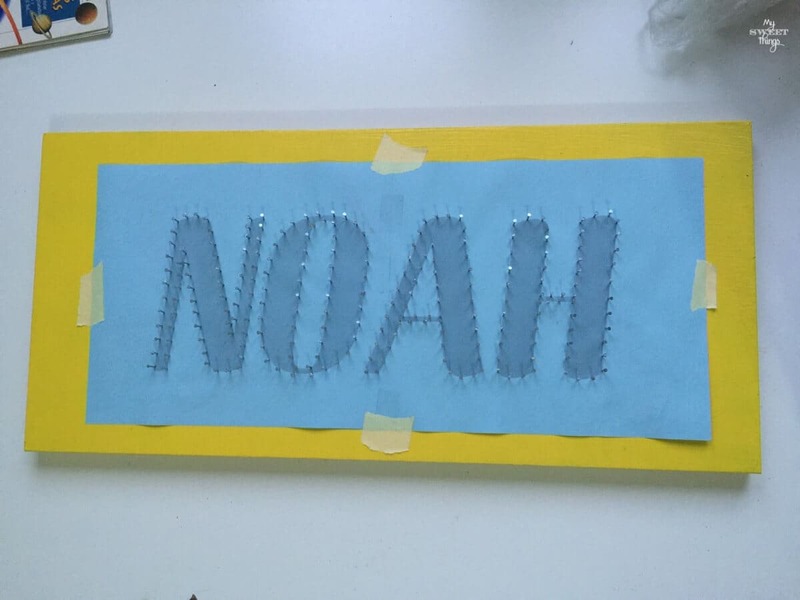 I’m sure Noah will love it and how special to use his favorite colors! Wow. This looks amazing. I think the older kids can make this as a great craft for hanging in their rooms. Thanks for the wonderful idea. Yes, my older daughter who is 8 has made one for her room and she is working on another for a friend. It is not difficult and they usually enjoy to hammer the nails. Pili, I love it! It’s a personal and special gift and looks lovely! How cool that string art, I’ve got to try it eventually! I like gifts like these, because many times you don’t know what to give a child and I personally prefer this over a toy! We decided to make our own gifts about 3 years ago, and it’s been a success. 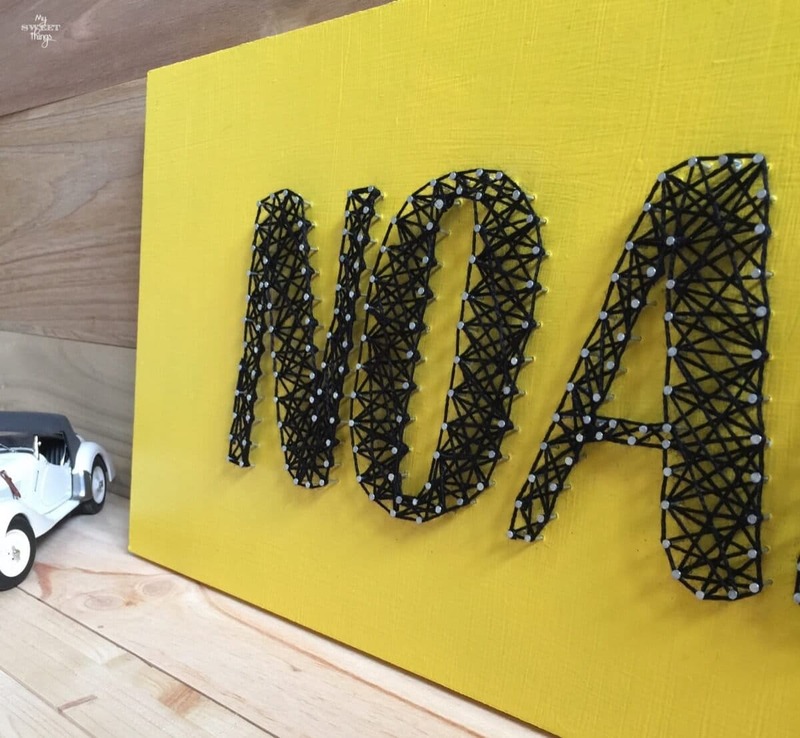 We’ve made so many different things, but string art is really fun and cool. Nice job! I love giving handmade gifts – especially to kids. So much better than adding another plastic toy to the pile! I agree Jen, everything is better than a plastic toy! All of our friends still remember the gifts we gave them. 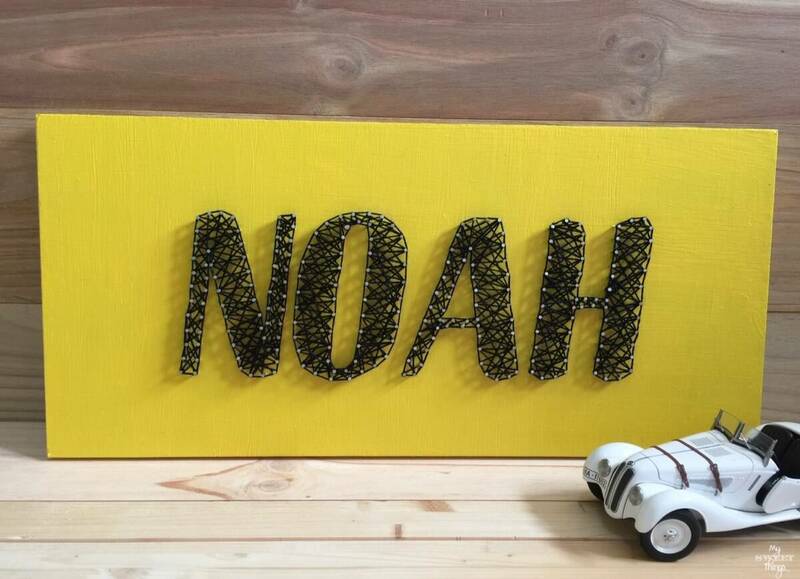 Such a lovely idea Pili, I love the yellow and black combination, it makes such a nice statement and I’m sure Noah will treasure it for a very, very long time. Oh how pretty! I love how the black stands out from the yellow. so cute, what a great idea for a kiddo!